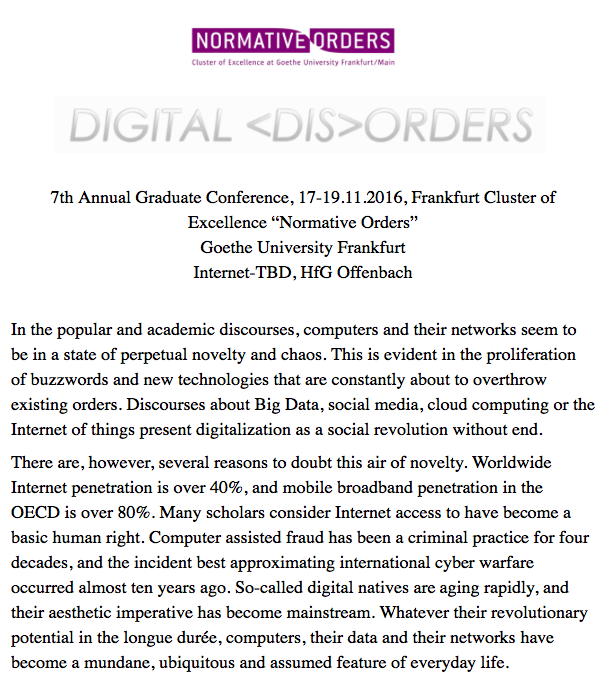 We warmheartedly invite you to submit both theoretical papers and artistic interventions to our ongoing collaboration with the Goethe Universität’s research cluster of excellence “Normative Orders”: the graduate conference in November under the topic of “Digital orders”. Submissions can enter until June 30th. We are also happy to announce our second keynote speaker Zach Blas. There are, however, several reasons to doubt this air of novelty. Worldwide Internet penetration is over 40%, and mobile broadband penetration in the OECD is over 80%. Many scholars consider Internet access to have become a basic human right. Computer assisted fraud has been a criminal practice for four decades, and the incident best approximating international cyber warfare occurred almost ten years ago. So-called digital natives are aging rapidly, and their aesthetic imperative has become mainstream. Whatever their revolutionary potential in the longue durée, computers, their data and their networks have become a mundane, ubiquitous and assumed feature of everyday life. We welcome innovative contributions from emerging scholars from all disciplines. These can include scientific papers but can also engage with digital disorders more broadly, for example, in the form of multimedia presentations or artistic interventions. The deadline for submissions is 30 June 2016. Please send submissions (up to 300 words, three keywords, and a short author bio) and questions via Email. Follow the conference on Twitter! Before: Why do you want to work here?